As I read the latest example of The New York Times' propagandistic coverage of the Ukraine crisis on Tuesday, it struck me that if these same reporters and editors were around in 1953, they would have cheered the coup against Iranian Prime Minister Mohammad Mossadegh as a popular "revolution" putting the beloved and benevolent Shah back on the Peacock Throne. Similarly in 1954, these credulous journalists would have written about another people's "revolution" in Guatemala removing President Jacobo Arbenz and restoring law and order behind well-regarded military commanders. The Times would have airily dismissed any suggestions of U.S. manipulation of events. And, for decades, that was how the Central Intelligence Agency wanted American journalists to write those stories -- and the current crop of Times' journalists would have fallen neatly into line. Of course, we know historically that the CIA organized and financed the disorders in Tehran that preceded Mossadegh's removal and pulled together the rebel force that drove Arbenz from office. And, the evidence is even clearer that U.S. government operatives, particularly Assistant Secretary of State Victoria Nuland and U.S. Ambassador Geoffrey Pyatt, helped orchestrate the 2014 coup that overthrew Ukraine's elected President Viktor Yanukovych. Indeed, journalists knew more about the coup-plotting in Ukraine in real-time than we did about the coups in Iran and Guatemala six decades ago. In the Ukraine case, there was even an intercepted phone call just weeks before the Feb. 22, 2014 coup revealing Nuland handpicking the new Ukrainian leaders -- "Yats is the guy," she said referring to Arseniy Yatsenyuk, who would become the post-coup prime minister -- as Pyatt pondered how "to midwife this thing" and Nuland dismissed the European Union's less aggressive approach with the pithy remark, "f*ck the EU!" Several months earlier, on Sept. 26, 2013, Carl Gershman, president of the National Endowment for Democracy (a U.S. government-funded operation that was financing scores of Ukrainian activists, journalists and business leaders), stated in a Washington Post op-ed that Ukraine was "the biggest prize" and would serve as a steppingstone toward eventually destabilizing Russia and removing Russian President Vladimir Putin. After Gershman's op-ed pronouncement, Nuland and Sen. John McCain personally cheered on anti-government protesters in Kiev's Maidan square. 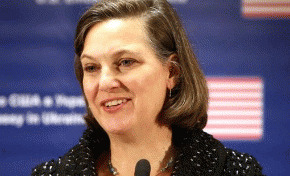 Nuland literally passed out cookies, and McCain, standing on stage with right-wing extremists from the Svoboda Party, told the crowd that the United States was with them in their challenge to the Ukrainian government. Meanwhile, Pyatt advised the coup-makers from the U.S. Embassy. The U.S. interference was so blatant that George Friedman, founder of the global intelligence firm Stratfor, called Yanukovych's ouster "the most blatant coup in history." Blatant to anyone, that is, who wasn't part of the U.S. government's propaganda team, which included the foreign desk of The New York Times and virtually every mainstream U.S. media outlet. Following the script of the State Department's propagandists, the Times and the MSM saw only a glorious people's "revolution." However, ethnic Russians from Crimea and eastern Ukraine, the key bases of support for Yanukovych, resisted the new order in Kiev. The people of Crimea organized a referendum in which 96 percent of the voters favored seceding from Ukraine and rejoining Russia, ties that went back to the Eighteenth Century. When Putin and Russia agreed to accept Crimea, the Times and the MSM announced a "Russian invasion," although in this case the Russian troops were already stationed in Crimea under the Sebastopol port agreement. Although the Times at times would acknowledge the key role played by the neo-Nazis and other ultra-nationalists, that troublesome information -- along with the Nuland-Pyatt phone call and other evidence of the coup -- would disappear into the Memory Hole when the Times was summarizing the Ukraine narrative or was decrying anyone who dared use the word "coup." As far as the Times was concerned, what has happened since February 2014 was simply a glorious "revolution" with "pro-democracy" Ukrainian idealists on one side and propaganda-deluded ethnic Russian automatons on the other, de-personalized and ready for the killing. And behind all the bloodshed was the evil Putin.